DURABILITY MEETS SPEED: Part workhorse. Part racehorse. With speed and acceleration that blur the line between work and play. Freedom to roam at 40 mph. And legendary Kubota durability. The gas-powered Sidekick is built for speed and to get the job done right. Clicks the tabs below for more information on Sidekick features. 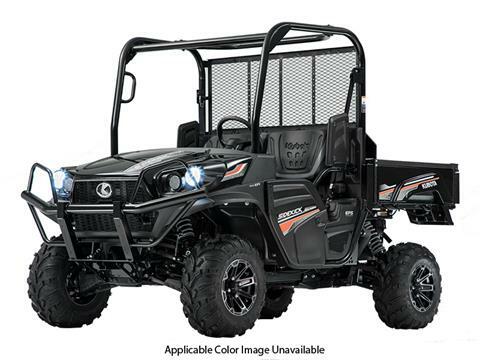 POWER: TAKE ON THE TERRAIN: Kubota's all-new 851 cc 4-stroke twin cylinder gasoline engine was designed to deliver a smooth 48 HP. Equipped with EFI for increased reliability and coupled with Kubota's limited slip 4-wheel drive system, the Sidekick allows you to take on the toughest terrains. ENJOY THE RIDE: Tuned suspension for handling any rugged terrain, with full or empty pay load. Enhanced steering geometry coupled with speed sensitive EPS provides excellent control over any terrain. WORK HARDER, LAST LONGER: The Sidekick is the ultimate extra hand around the ranch. It can move 1,000 lbs. * in the bed and tow up to 1,550 lbs. on hills and 2,000 lbs. * on flat terrain which makes feeding time in those upper pastures quick and stress-free. HANDLE THE CARGO: The All-New Sidekick was designed to handle 1,000 lbs. * of cargo allowing you to get more done around the property. 48 HP GASOLINE ENGINE: The Sidekick’s quick acceleration and high transport speed – up to 40 mph – comes from a powerful 48 HP gasoline engine. Idle Speed Control (ISC) and highland correction ensure stable power for any situation. Equipped with a CVT-Plus transmission, this rugged, water cooled engine provides plenty of torque for an astonishingly quick and smooth acceleration. CVT-PLUS TRANSMISSION: The Sidekick is equipped with Kubota’s worry-free CVT-Plus Transmission. The centrifugal clutch keeps the heavy, double-cogged belt tight for minimal slippage, ensuring fast response and excellent belt durability. Fully shielded to keep out dust and water, the CVT-Plus also cools the CVT belt with a large cooling fan for even greater durability. FRONT & REAR INDEPENDENT SUSPENSION: Even when fully loaded, the Sidekick won’t bottom out. Front and rear independent suspension delivers a smooth ride with plenty of ground clearance. Equipped with high strength Urethane bushings throughout the suspension for increased durability. SPEED SENSITIVE EPS: Light at low speed and firm at high speed, the Sidekick’s speed sensitive 45A EPS (electric power steering) offers exceptional steering control, improving not only handling, but also stability. Standard on all RTV-XG850 series models, the EPS ensures outstanding performance even during full payloads. ENGINE BRAKE: The Sidekick’s one-way sprag clutch and centrifugal clutch provides engine-assisted deceleration, letting you concentrate on steering rather than braking and giving you dependable control down steep slopes. SELECTABLE FULL-TIME 4WD - SIDEKICK: The selectable full-time 4WD system ensures outstanding traveling performance, even under heavy loads, providing superior traction. CARGO BED: The Sidekick really shines when you’ve got a big job to do. Its heavy-duty steel cargo box can carry up to 15.2 cubic feet or half a ton (1,000 lbs.) of tools, firewood, gear and supplies. Plus, with a seriously smooth suspension and extra ground clearance, the Sidekick won’t bottom out. So go ahead, load it up! DIGITAL CLUSTER & TILT STEERING WHEEL: The smart new Digital Panel alerts you to all major vehicle functions with seat belt, parking brake alarms, overheating and intermediate gear control indicators. The modern, white LCD display provides excellent visibility at all times. Designed to match the bold style of the Sidekick, the ergonomic steering wheel can be adjusted to fit your posture for easier handling and greater comfort. LED HEADLIGHTS & DC OUTLET: Let your Sidekick lead the way with cutting-edge LED headlights that offer improved illumination for outstanding visibility. Optional LED available for four LED lights for even greater visibility. Charge your phone or other electronic device on the go with convenient DC outlet, or use optional lighting equipment when out in the field as well. HALF DOORS & 60:40 SPLIT BENCH SEATING: Half doors keep out dirt, brush and other unwanted elements while making it easy to get in and out. Shoulder guards on the ROPS help keep everyone inside the vehicle during operating. The split-bench seat style is ergonomically designed to provide hours of working comfort. The seat design provides the appropriate space for both driver and passenger. STORAGE: Large compartments under the split-bench seats are ideal for storing tools, tie-downs and personal items. A convenient cup holder keeps your beverage tumbler or travel mug secure and always within reach. A large glove box on the passenger side provides quick and convenient access to personal items and frequently used gear, and is equipped with a lock for securing personal items.